If you are a brand owner, retailer or an entrepreneur looking to find your way into the world of ecommerce, we have a good news for you. What’s in the Book for you? 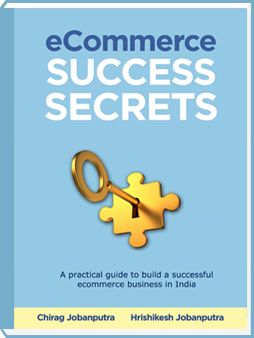 Using the knowledge and insights in this book, you will stop being an ecommerce victim and GET on the right course towards making your online business successful. Chirag has 14+ years of experience in launching successful online properties for prestigious companies and government organizations. He has developed and implemented website strategy for leading companies such as Kotak Bank, Network 18, CtrlS, Coal Junction, and Landmark Group. Hrishikesh Jobanputra is an author and marketing advisor to forward thinking entrepreneurs. He has 16+ years of experience in marketing, strategy and consulting. Hrishikesh has developed marketing strategy and systems for businesses of all sizes.